Mt. 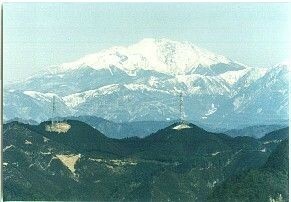 Ontake overlooked from Mt.Noko ● Welcome to our homepage. ● This is to introduce our hometown "Hichiso", peaceful small town in Gifu Prefecture. Here, you can know various aspects of our hometown. We feature "SHISHIMAI" dancing lion, stone Buddha, wild flowers, and much more of our attractive scenery. Further, we introduce our volunteer activities. You also will find interesting information on dams, such as amount of water storage. Please don't miss our collection of useful sites as well. You have been the caller since June 15, '97. This is a chat room where all mails from visitors to our HP are collected. Please drop in. The subject of a lion dance is abundant at introduction. Bulletin Board System page. Please try and enjoy. This is the volunteer organization which started activity for "Town of miniature garden in which Ryujin lives"
city planning to the concept. The network of the volunteer organization in Hichiso-cho has been made. Please get information on their activities. Traditional entertainment's "Lion dancing in Taira"
A report of brilliant "33 Kannons in Taira"
The corner to introduce our hometown Hichiso-cho. The content is becoming substantial little by little. data: 16 Apr. 2019　16 Apr. ・Click a right-hand side button after inputting a keyword! This is a link freelance site. I'm waiting for your mail.